HAWAYO TAKATA - Goddess T.O.U.C.H. Hawayo Takata brought Reiki to the Western world. While there are those now critical of her style and methods, her one greatest achievement is the transplanting of this gentle spiritual Eastern healing modality to the West. It stands as her gift to humanity. Culturally she was well-suited to the task. Born into a Japanese immigrant family living in what was then the U.S. territory of Hawaii, she was raised with one foot in the American version of Western culture and the other foot in the Japanese version of Eastern culture. It was a bi-lingual and bi-cultural gift which would serve the diminutive lady well. As she presented her life story to her students, it, too, was something out of Joseph Campbell’s book, The Hero With A Thousand Faces. Here’s a brief summary of her autobiography as told to her students: Widowed, heartsick, and frail by her mid-30s, she was in failing health in Hawaii with a variety of serious abdominal ailments. Seeking a cure she travelled to Tokyo for medical care where she was scheduled for major surgery as some of her problems were potentially life-threatening. At the last minute she cancelled the operation when her intuition told her it wasn’t necessary. She then asked the head surgeon if there were somewhere she could go for a non-surgical remedy. The surgeon gave her the address of the clinic run by Chujiro Hayashi. There she discovered Reiki. The Reiki treatments worked, and she was cured of her serious ailments, which included gall bladder, appendicitis, and a tumour. 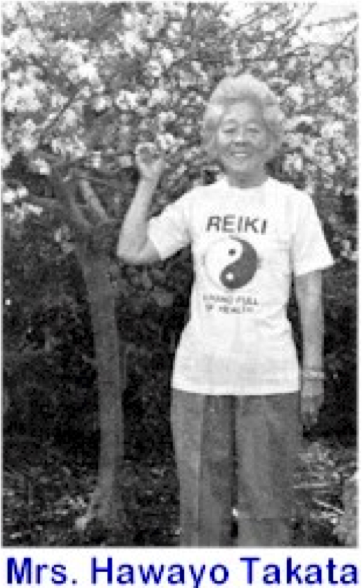 She stayed on to learn Reiki herself from Dr. Hayashi, whom Mrs. Takata described as Reiki’s Grand Master. In 1937 she returned to Hawaii in good health to set up a Reiki practice which soon was taking up all her time. But in 1940 she was summoned to back to Tokyo by Hayashi. The clouds of war were on the horizon, and Hayashi (a Naval Reserve Officer) knew he would be summoned to military duty, something he did not wish to do as a peace-loving Buddhist and Reiki master. Mrs. Takata says Dr. Hayashi announced that she would be his successor as Grand Master (she by this time having been made a Reiki Master), and he then peacefully made his transition (Reiki’s expression for passing on or dying). Mrs. Takata returned to Hawaii, and for the next 30 years she taught Reiki (first and second degree only) and put together a successful clinic living a full and vigorous life. Up until 1970, Mrs. Takata had not made any Reiki masters, although scores of people had been trained as practitioners by her. Apparently becoming aware of her advancing years and realizing the torch needed to be passed on, she began training Reiki Masters between 1970 and 1980. The number varies depending on who is telling the story, but apparently she initiated as many as 22 individuals as Reiki Masters during her last decade. In any event, while she claimed the title of Grand Master for herself while she was alive, she did not declare a successor prior to her transition, thus setting the stage for what has become the democratization of Reiki, a process not without controversy. Her legacy is mixed. Certainly those in the Western world who have had the blessing of Reiki in their lives are grateful to Mrs. Takata for bringing Reiki to our society. Yet she has been the recipient of posthumous criticism in three major areas, her claim of Grand Master, her inaccuracies about the history of Reiki, and her high fees. Independent researchers travelling in Japan in the past 10 years have discovered that it is quite unlikely Dr. Usui ever designated a successor or even claimed the title of Grand Master himself. Apparently he did initiate several Reiki Masters, of which Chujiro Hayashi was one, but they were all equals. None was of a higher rank than others. Dr. Usui did set up an organization to carry on the work of Reiki but he did not set up a Grand Master system. It is anyone’s guess how Mrs. Takata came to claim to be the Grand Master, given this background which she would have known about. Critics have not been kind about her motives. In any event, her Grand Master claim certainly set the stage for much controversy in the Reiki world today. Her fee structure for Reiki training leaves many in the 21st Century absolutely thunderstruck. She charged $10,000 U.S. to become a Reiki master for those few she selected (this was in the 1970s). First and second degree Reiki training was several hundred U.S. dollars each. The criticism is that she was creating an elite club for the wealthy. Her justification for her fees came from a part of the story of Dr. Usui which she told. In this part of the story she has Dr. Usui coming down from the mountain after his epiphany experience and going off to the beggars’ quarters of Kyoto to heal the indigent. Initially Dr. Usui has great success. The beggars are regaining their health and returning to mainstream society. But after a while he noticed many of the beggars returning to the beggars’ quarters. According to Mrs. Takata, Dr. Usui concluded that because the beggars had not paid for their healing they had no incentive to stay well. Thus the principle of an exchange of energy between practitioner and client was then introduced into Reiki by Dr. Usui, Mrs. Takata said.